The ANC's call for Haiti to "embrace the rule of law and democracy" is a phrase taken straight out of US state department media releases. It is no accident that this call has this ring - it is the language of the cosmopolitan bourgeoisie. The ANC is the political party of the bourgeoisie in South Africa and Thabo Mbeki is its mouthpiece. It is no surprise that he wants to return Haiti to the old order of things i.e. to bourgeois democracy and the laws of the capitalist class imposed on the working people. That is what Thabo Mbeki is calling for. There is only one caveat: Aristide must be put back at he helm. Thabo Mbeki's call for Aristide to be returned to Haiti and for his political cronies to be released from jail at first has a stately ring. The pedestrian mean-meaness of this call, however, soon becomes manifest. Mbeki says nothing about the ten thousand ( by Aristide's account) workers that have been killed in Haiti since February 29, 2004. Not a single word about this loss of life among the working people. Instead he calls for a return to: law and order; democracy; the rule of Aristide; the constitutional order. And the organization of 'free, peaceful and fair democratic elections.' It is a crass appeal for the petty interest of his class brothers as opposed to that of the working people of Haiti. 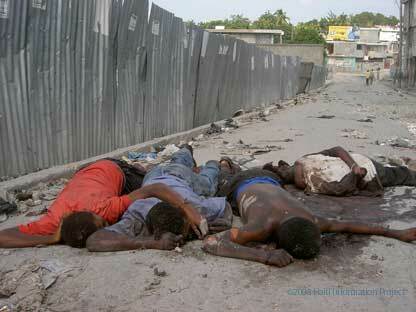 The masses of Haitian workers and peasants have not been duped. Certainly not the class conscious workers who are witnessing and analyzing what is being reported about Haiti in the media. entered the slum of Bel Air and shot these four young men execution style. more murders in their communities.